PC #123 – Braced up! I got my brace today! It came in from the US, landed it cost $630. If I’d brought the same brace here in Australia, it would have cost $1200 + freight. I got a local physiotherapist to fit it – the fitting cost $45. And so now I can start walking again. The physio recommended short walks, slowly increasing the mileage. I feel like I’m getting my life back! haha – no way Jill. It will just be great to get out onto my track again. It takes me out into the bush, and the vineyards. It’s very beautiful. Except at this time of the year, you get attacked by magpies. (birds) They can be quite vicious, and they can rip out a piece of your ear! That sounds wonderful sans the magpies!! You lead a great life in what sounds like a great place. Jill – the great thing about living here is that Jennifer has her family around her. Her sister lives next door, and comes over regularly. Then her mum lives the next house over. Her mum is quite frail now, so Jen spends a bit of time with er each day, and helps her do practical things, like paying bills, banking, taking her out shopping etc. Right at the moment it’s the best place for us to be. When her mum dies though, which will happen soon, then I’m not so sure. Oh, I see. Are you considering other places in your country or are you thinkin of coming our way?? if there was any other place in the world I’d like to live, it would be NY. But I think it would be hard to follow the cricket and my Sydney Swans on ESPN!! Your reply “haha – no way Jill” reminds me of how you assured your wife that you would take it easy at the start of your camino! (I am reading and enjoying your book.) However, I hope you have gained some patience since then. I hope you’re enjoying the book. It’s quite true that I got lost 100 metres from the gates of St. Jean. Yes, lessons learnt from the Camino – I don’t have to prove anything to myself. 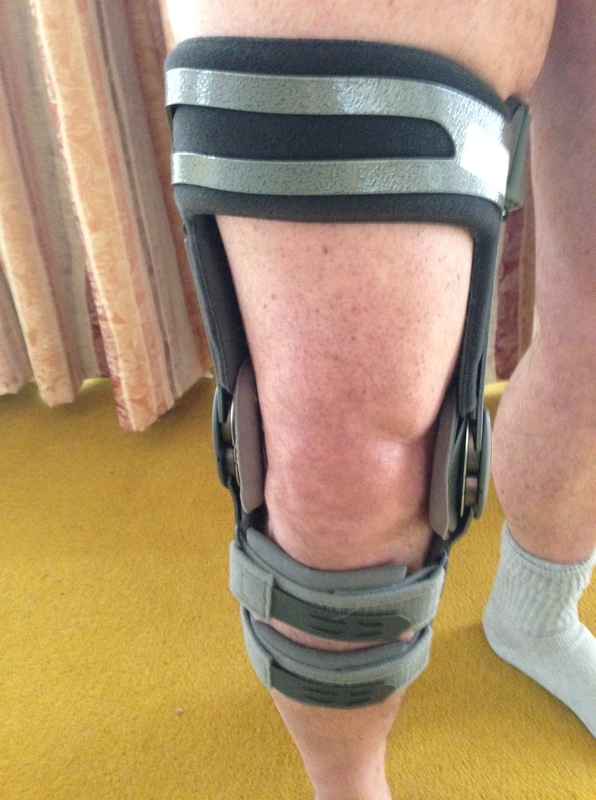 The brace has had an immediate effect, taking the load off the damaged part of the knee. How exciting Bill! Relish those walks on your track – especially the short ones! and best wishes for healing that knee. Impressed to see following the Aussie cricket and the Swannies is a consideration for you – they need all our support at the mo! if the Poms win the Ashes on our soil, there will be no greater ignominy. And I think it’s best we don’t think about the dear Swannies’ last game. At one point in my career, I had the opportunity to make films in Hollywood. My family and I were living in the Hollywood Hills. I’d just completed a film for Warners Bros, and I was being offered more studio pictures. I decided to return to Australia and make smaller Aussie films, because I didn’t want my children growing up with American accents and knowing the names of the LA Dodgers instead of the Australian cricket team. I think creativity comes from a cultural well – if you are not sure if you’re Australian or American, how can you contribute culturally? Where do you pull from? So I returned to Australia – and now my boys ring me up to talk about the cricket, or the Swans, and I’m a proud father. Isn’t it a marvellous thing!? Mine is black, but the same model -and I have taken to wearing a neoprene sleeve to protect the skin. Also, its warmer. Don’t let it get you overconfident at first!.But isnt it wonderful to be mobile again? Im so happy for you, Bill. do you have the same one? We’ll be able to swap brace stories on the Portuguese tour! This one is a Donjoy OA Offloader – or Offroader or something! It is surprisingly light. I have it on at the moment and it doesn’t feel like it’s on. I had visions of the Roadrunner when I first put mine on! I’ll try and get mine in October or November. I’ve just come back from a 4km walk and it was pain free! The knee out of the brace was tender after the walk. I will have to ease into it! Bill, sit down for a minute. Are you comfortable? Good. BE CAREFUL!!!!!!!!!!!!!!! Even with the brace,overdoing it can set you back to the point where you will have no choice left but surgery. Take it slowly, or be prepared to have the pleasure of your walks taken away from you. I’ve done it wrong, and its not worth it. One day off, one day on at the very least. Hi Sister, very good advice, thank you. Yes, I won’t walk today. But I’ll do the stationary bike. I’m 2nd day into a water fast though so I need to be aware of my limitations. Bionic Bill! I bet it was such a relief to be able to stand and walk without pain for the first time in months? Years? And the brace should now help with the knee’s healing. My camino training walks are through our bush (high desert steppe) and wine country too. This time of year the colors of the grapes ready to be picked are such a treat! Haha – yes Susa, I’m the $630 man! It was so wonderful to walk pain free. I might give it a miss today – just let my body recover. Your walk sounds like it takes you through glorious country. Where do you live? And can you post some photos?